The mailing lists require subscription in order to post directly, not requiring moderation. The mailing lists may be subscribed to on either an individual posting basis (you would receive > 100 emails in your inbox on a daily basis) or in a digest format (all emails for the day would be contained in a single, large possibly, email). [Nabble, a free web service, was setup to both archive the foundations emails, onto another server, and to offer additional web based options for using the mailing lists. 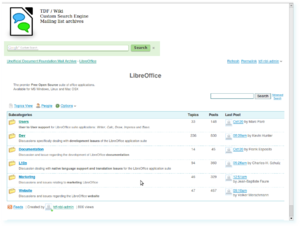 These augmented services are expected to aid a large number of LibreOffice end users looking to get an answer to specific and reasonably infrequent questions. The goal is to offer an easy way for these casual users of the mailing lists for support services to post their question, receive only, and with some certainty, responses to their questions. The web service also offers the ability of the end user to receive regular updates, via their email address or via ATOM feeds. In both situations the user may configure which lists and which emails they want to be notified about. The user may select to receive notification for all new Topic Posts - this is an email arriving at the list for which there is no preceding email which it is linked to. It would be accurate in most cases that these are original questions coming into the list, people offering support responses often refer to the person that posted this first, Topic, email as the OP (Original Poster). Nabble also allows for the web services to be used from within a simple to use widget. 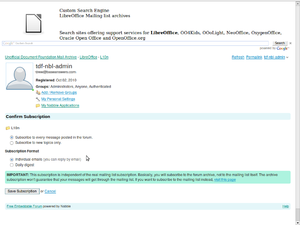 This widget is used, along with another, a Google Custom Search Engine search box on the OpenDocument User Community Volunteers, Unofficial Document Foundation Mail Archives (UMLA) web site. The Document Foundation mail server will send a confirmation email to your inbox, you must reply (using just hit reply-button) and at that point you are subscribed to the list. Using Nabble to subscribe to the Document Foundation ML your subscription is utilizing the no-mail parameter. This means that you are now authorized to post emails from anywhere, your desktop mail client or the UMLA web page and the email is dristibuted to all members subscribed to the list. 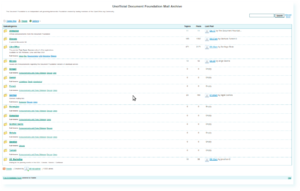 With the no-email parameter, as I said, it does not send responses to your inbox, however the mail view grid on the UMAL page supports a threaded display, as well as simple list. This makes it quite easy to visit back at your leisure, or hovering for an answer, to see when the first email reply is added to your Topic thread. If I am already subscribed to a TDF mailing list can I simply post using the web interface, no further subscription needed. Yes - in a public place, a library perhaps you can easily post to your TDF mail list account. 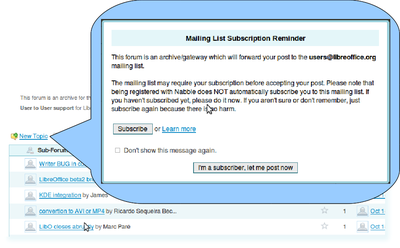 When you click on the New Topic button you will get the same Subscription Reminder dialog. Simply click on the "I'm a subscriber, let me post now" button. Nabble menu item to change mail list subscription settings, such as whether you receive emails from the list directly in your Inbox. This page was last edited 09:37:07, 2014-03-28 by Dennis Roczek. Based on work by Drew Jensen.